There's just too much that time cannot erase..."
I apologize in advance for any mature themes that may arise! Your voice it chased away all the sanity in me"
Keres, having been reformed postmortem and risen from beyond the grave, is understandably quite intimidating to behold. Her entire body is gaunt and alarmingly thin, looking as though her sooty grey pelt is stretched over her bones. She has the look of one who is entirely malnourished, and even when she eats a healthy amount, finds it difficult to put on any weight whatsoever. 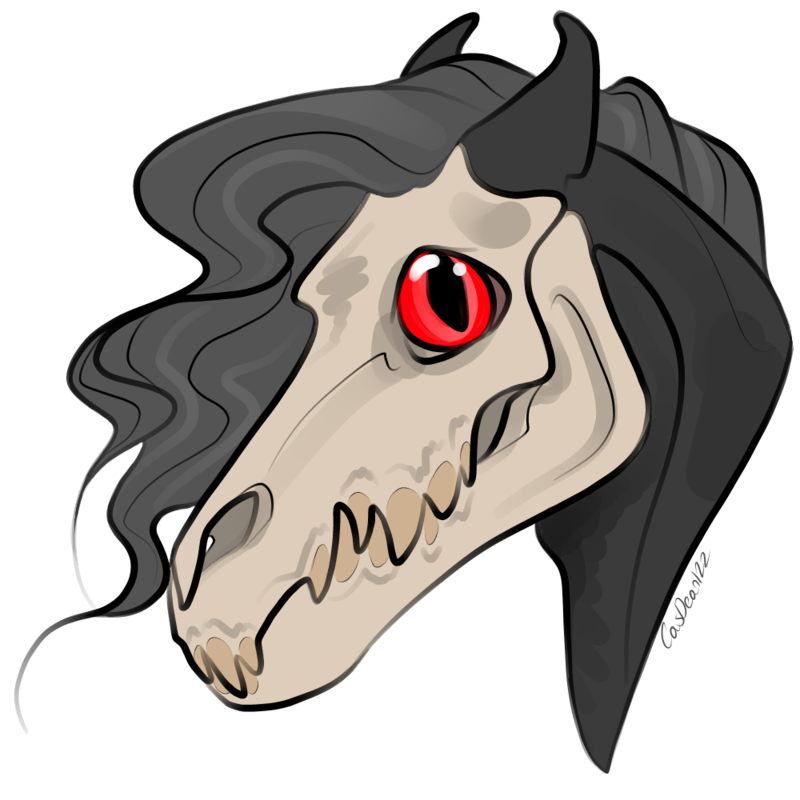 Her face, disturbing in its own right, is simply an equine skull- with large, yellowed fangs interlaced like a crocodile's. Her ears seem to be in the normal location, freeing themselves from behind the bony countenance. The left is pierced with two silver hoops. The white bone of her face is marked with navy blue war paint, in eddying swirls and faint twisting trails. This is also showcased throughout her form, decorating her neck, ribs, and haunches, with some on all four ankles. There are two small stripes of this on her chin. Her eyes are set into deep sockets, a deep crimson red, that glow in different tones of brightness depending on her mood. Her hooves are a deep slate, just faint touches darker than Her fur. Her mane and tail are lighter grey than her pelt, and long; her forelock falls almost endearingly over her eyes in any breeze, and her tail is just barely not brushing the ground. Despite her ghastly looks, her fur is lustrous and shiny, though interspersed with many thick scars- it may seem her only true saving grace, however, is her voice. It is sultry and with a pleasant rasp, gentle but steeled with sorrow. It is quite beautiful. But though you're still with me, I've been alone all along..."
Before her transformation, Keres was hopeful and optimistic, seeing the light in everything- and everyone- even when others argued that it wasn't there. She trusted blindly, innocently, a kind and truehearted mare. When her tradgedy befell her, she became forlorn and listless- depression consumed her days, self hatred coloring her worldview and painting her in enough red to fool herself into believing she was unworthy of any affection. Others feared her ghastly countenance, driving her away in fear and sometimes even causing her great harm and peril. This only worsened a deprecation that had started to grow like a poisened seed within her heart. It was hard for her to trust anyone for a very long time, for she believed they would all come to see her as what she saw in herself- a monster. She was still foremost gentle, but the cruel world forced her to learn to be strong, to fight when necessary- though she would rather flee than harm a single soul. She is brave, and courageous, with a loyalty like no other. Lucky is the horse who can experience this side of her. She protects herself with a hard armor of detachment to strangers, but adores children, and is kind when she knows you are no threat. Upon her arrival in Elysium, she was invited into Corona herd. The king and others showed her kindness, did not flinch away from her hideous face or her strange, warped form. This allowed her to realize that she was more than a beastly creature- that she was worth something. She found love and acceptance, family. Her son, Asclepius, and her mate, Kalos, helped her learn what it felt like to be cherished, and to remember how it felt to be part of something greater. She was happy and content, peaceful and soothing... Truly a changed woman. But it is the nature of life that all things must end; and end, they did. When separated from her mate, and eventually her son, the sweet, loving Keres fell back into a misery that surpassed even what she had known after her resurrection. She became listless, lost weight, refused to nourish herself or eat a single blade of grass. She never attempting to kill herself... But some might say she had done her very best to die. She became haunting and melancholy, making others weep and fear for what became of the kind once-queen they had known. She drew away from any and all, pining after a son and a husband She thought dead. Still she was plagued with a nearly supernatural maternal instinct, as it had developed into something vicious and hungry, like a mother bear in lean winter, an alligator defending her clutch of eggs- desperate for something to care for, fighting off primal urges that weren't from the rational part of her mind, she took to catching small animals and nursing them, though their terror always drive her to release them after a day or so. Hidden beneath her grief is that sweet sunshine soul that once had poked its way through the darkest clouds- is it possible, buried within these increasingly disturbing sadnesses, her old self remains? From her horrid plight I release to you a single question; is it worse to love and lose everything, or to have never tasted love at all? But you still have all of me..."
They say that love is blind. Truer words cannot be spoken... For certainly, they could be used to describe each facet of her life in complete summary. If you gaze upon her, you would know with near certainty that this life is not her first- once, in fact, she was as beautiful as spring rain, beloved to her clan and all those that met her. Her beauty of heart and body was such that she gained the attention of many a young stallion in search of a match- and, as naive young girls are wont to do, she gave her heart to a handsome man who came to her with smiles warm and flowers of many sorts tucked beneath his chin. They wed two seasons after their meeting, both devoted and foolishly unrequited. Her husband guarded her from the admiring eyes of others with a jealous love, giving everything to her, and she, in turn, to him. Now, reader, it may be said that perhaps the handsome stallion loved his woman too much- for he soon became possessive, unwilling to allow her even to wander the woods for fear some rutting plebian would happen upon her and be unable to restrain himself. He became obsessively involved in shielding her from the world, isolating the sweet girl from even her own family; the young woman was far too enamored with her beau to notice how completely twisted his devotion was growing to be. Living some half mile from the rest of the herd, they continued their days like lovers locked in a honeymoon phase. These final weeks of merriment and passion were the last traces of light on an otherwise dark horizon. For soon, her husband's jealousy became irrational, unbearable. Her forbade her from traveling to the village when He saw an elder smiling at her over his cart of baked goods, and after she struck up a conversation with some ladies at the river, refused to allow her even to gather water unless he was present. Each night, he made increasingly intense physical demands to assuage the paranoia his crazed mind had fallen into. Soon, the poor, social female began to grow longing and lonely, locked away like some kept woman. As brave as she was foolish, she finally broke and stole away in the early morning to visit her family for the day, wishing to allay the fears that had taken root in the house They shared. She enjoyed hours of laughter and sociality with her parents and siblings- and all day, her husband stayed away. Taking this as a sign he was finally learning to relent, she remained in the village until nightfall. Bidding her kin adeu, she set out into the dusk-ridden woodland to make her steady way home. She, of course, had no way of knowing that this night would change her fate forevermore.
. Seeing her face looking to gaze at his approach, the enraged lover fell upon her like a God of war, bringing his wrath to bear in a violent haze of greed and seething anger. He battered the struggling female to the earth, his relentless hooves bloodying her screams until they were bought but gurgles. Gone mad in his emotion, he desperately forced himself upon her mangled body, the girl just barely clinging to life. It was unfortunate she did not die before he was finished, for if she had, he may not have noticed and simply let her spirit drift into an oblivion far more peaceful than the hell he was creating for her on earth. But as he finally took to his hooves, sanity just barely ringing the edges of his mind, he witnessed his beloved's tangible fear, her wordless, agonizing despair as bloody tears made tracks through her mud cacked fur. Horrified and suddenly full of panic, he watched as the life faded from her terrified eyes. Hysterics are not a rational thing, and neither was the stallion a rational man. Led by guilt and sorrow and pain and the urge to have her back to him, he drug her body away in a fog, muttering and lost in his own broken mind. He came to the long-forgotten cave of a grave witch, banished many a year ago for sinister practices. The madman laughed and sobbed his demands- that the hag bring his beloved back to life. The ancient old sorceress simply grinned toothily and bade him blackhearted warnings, for what was taken from behind the veil and forced back to the living could never be the same. Desperation ensured that the man paid her no heed. The witch spent hours that night performing horrible and disturbing rituals over the corpse of the mangled girl, elder magics slowly dragging Her from her peaceful rest and back into the cruel world. It was at the first shinings of dawn that the young woman finally opened her eyes. Slit pupilled and reptilian as they were. Disfigured and disoriented, pain in every nerve, the girl struggled to make sense of what was happening. Hadnt she died? He had beat her to death... She remembered a warm, welcoming darkness, drifting through a river of joyful memories, and then, rudely shoved back into cold. Lying on something hard... Stone? She shivered, feeling as if she had been chilled to the bone. Her gaze swam with nausea, her stomach churning. But no blood? She smelled none on the air, felt no wounds. Just an endless ache. Struggling to sit up, she tried to focus her blurry sight, managing to clear away most of her vision and see the old hag leaning over her. Frightened, she thrust herself upright on shaky legs, some guttural hiss escaping her maw. Disturbed, she jerked away- and came face to face with her husband, who stood frozen with fear. Confused, she stumbled forward; he scrambled away, flattening his ears and neighing shrilly in disgust. She saw disdain and terror grow in his eyes, and full of unsurety she glanced around the room. But as her stare caught the reflection in the cave pool, two glowing snakelike eyes gazed back at her. All she could do was scream. Taking advantage of her distraction, the horrified mate threw himself at her, ready to destroy the thing he never should have brought back to life. She was broken, unnatural, And he knew she had to die again. She darted away, but he flung his hooves for Her bare, fleshless skull, intending to cave it in and be done with her. But his assault came to an abrupt halt as the witch struck him down her her magics, dark tendrils of sorcery strangling the cruel lover until his heart beat it's last. Proud of her ability to resurrect a living soul, even if it looked like this, made her eager to protect her creation from harm, especially from the idiot who had ruined her in the first place. Pitying the woman who she had pulled so unkindly from the afterlife, the witch set her up with some provisions And instructions on where best to go. The girl changed her name, refusing to be called by anything other than Keres- a name derived from the goddesses of old. She couldn't bear to show her hideous face to her family, and so the grieving woman set out on her own, where began another life whose happiness would be fleeting and more painful than anything previously felt. Having ventured far and wide to flee her past- driven away from every land out the inhabitants' dear of her accursed face- Keres came to the Elysium claiming grounds; a wasteland of ash as full and tattered as her own broken heart. Filled with misery and left with no hope, she collapsed in the consuming rain, letting the choking mud coat her body. She lay there, weeping... Waiting for death, whether it take the form of hypothermia, starvation, or something more sinister. 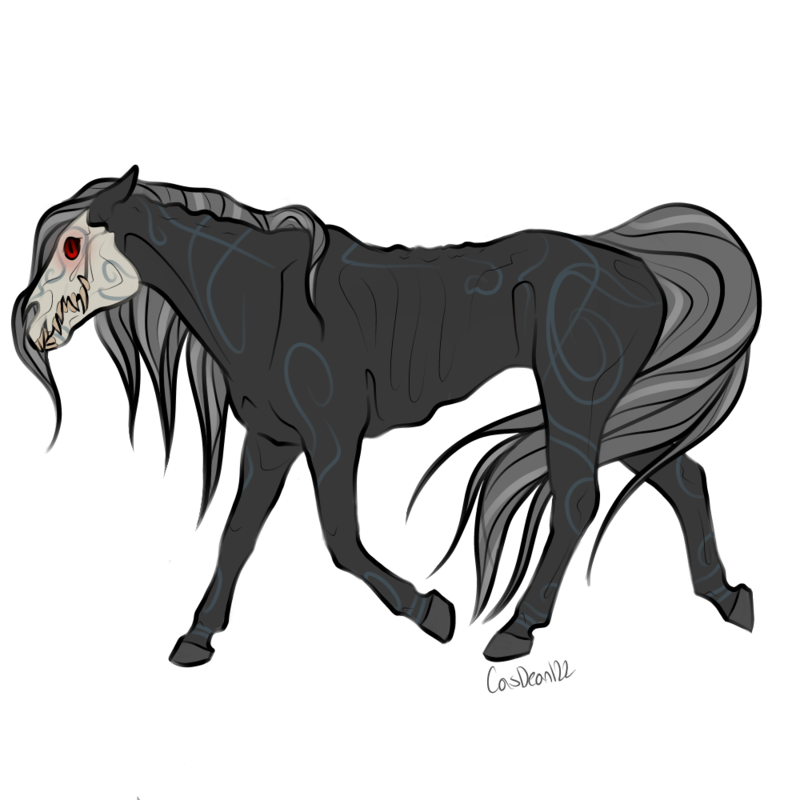 And yet, death did not come for her that day.
. She grew somewhat happier in the acceptance of Corona, whose members did not flinch from her or drive her out with threats and thrown hooves. She became unswervingly loyal, willing to sacrifice anything for her herd... Her home. She recruited many new members, swelling their ranks as few had ever done before. Later, she was introduced to the kindhearted and gentle Kalos Stratic- a stallion whose soul wove itself with hers so completely that nothing could have untangled them. But still, Keres feared. She feared that this was not real, that he could never love a monster. She feared she would lose everything again, just as she had before. Such was her unwillingness to believe in happy endings that she sought to create her own. She beseeched the godly Firstborn of Elysium to grant her wish: for a child to call her own, one without a father, for she knew that such a man would only break her heart. And in their divine way, the Firstborn answered her prayer. Now pregnant, Keres continued her devoted recruiting, but determined to give her bairn the best of her entire world. She ached with loneliness, but felt great excitement for the child that would come into her life in just a few short months. Fate, however, would not see her give up on romantic love so soon. Fate, which had stolen so many things from her, now sought to give something back. Unbeknownst to Keres, Kalos Stratic had been searching for her ever since their meeting- so enraptured was he by their first encounter, he could not let her slip away. It was by chance and desperation he entered Corona lands in the middle of the night, late in her term. She was thrust from sleep in the grips of a terrible nightmare of her death, and bolted through the Viridian Feilds, overcome with blind panic. The pair crashed together like meteors. Once recovered from their alarm, he calmed her fear and told her of his affections, and she hesitantly explained her unwillingness to let herself feel too strongly. They spoke long into the night, and Keres began to accept what she refused before- the beginnings of love. They slowly became closer as her pregnancy advanced- but still those three words did not pass between them. Not until the day her son was born. The birth was long and agonizing, for Keres was still a small, twisted creature, in body. Only half concious and hazy with pain and adrenaline, she whispered to him the truth of her heart, fearing she may never get another chance. A visiting soul, Io Karaivi, took note of their plight and offered her assistance, for the child was coming backwards, and his mother's health only increased the risk of death for both. After much struggle and both coming dangerously close to being lost, her child was brought into the world. Asclepius was her pride and joy from the moment she gazed upon him- he resembled his mother in many ways, but he was nothing less than perfect in her eyes. She and Kalos made their connection official barely a week later, when she was strong enough. They were married, and it seemed as if everything was perfect. When Malphas called a meeting of Corona, he recognized her tenacity in bringing people to their home, and her unbroken devotion to the herd. He honored her name with the title of Second in Command, and the more valuable- a friend. She continued her ways as Second, taking on responsibilities and assisting her beloved ruler with matters small and serious alike. When Malphas stepped down, her heart stung with sadness- for this was the king she would die for, and here he was beset by sadness, unable to lead. Shock soon was followed by awe. For that day was the day the people of Corona chose her as their new queen, in the wake of their loss. Dumbfounded, she accepted with the promise that she would do anything for her people, sacrifice anything. And she did. Near that same time, Kalos vanished without a trace, gone like sand on the wind. Her heart clenched as if in a vise, and no amount of days brought his return. Feeling as if she might shatter, she longed to go out and seek him out- but how could she leave her people when they needed her? A queen could not simply dissapear on some endless quest. And her son... She could not leave him to search, even if it was for the man who had become his father. She nearly broke in those weeks after he was lost. She hid her agony behind regality, standing for her herd even as her soul fell to pieces. She was queen for only a short time, but it cost her everything- she was crushed beneath the weight of responsibility, for it kept her from the only true love She had ever known. When the Fog struck the herd, she endangered her life to save her people, evacuating them from the fields and directing them out with the assistance of the bravest souls in Elysium. But somewhere in the confusion her son was caught- and she refused to give him up for her throne. She urged her people to leave, and charged back into the choking cloud With a sound like an enraged mother dragon, mindless with the instinct to save her child. She and others worked to rescue him, and all made it out alive. But as they sought refuge elsewhere, somewhere in the long journey from home to safety, it was as if some unspoken secret passed amongst them. She was no longer queen. She had chosen her family above duty, and they needed strength in the wake of this disaster. As Arae and Corona merged to form Carinae, a new herd to stand proud in the ashes of their deccimated cultures, she faded to the background, downtrodden and heavy with the loss of her friend, her mate, her people. But she still had her son. And no matter how tore up she was inside, she would never let him down. She cared for him with such dedication and love, the blaze of pain in her heart became not lessened... But somewhat bearable. New leaders came and challenged and left, but she stayed. Ever loyal to the straggling, altered bits of Corona that still remained in the tattered story they had become. Arête and Valor led well, and after the Khal's dissapearance, the Khaleesi was a just and good ruler. But in that time, Keres lost the only thing she was still fighting for. Asclepius vanished in a terrible parody of her mate's loss, the circumstances so similar that it broke her down and shattered her so entirely she May never recover. She searched for him over every land for months... But to no avail. Listless with her beloved son's absence, longing for the two souls which she had devoted herself to so utterly, the woman couldn't bear to stay in the herd that had lost itself just as she had. Elysium was but a massive reminder of her pain, and she forced herself to leave, the faces of her lost loved ones ingrained like brands into her mind. She now enters Fimbulvetr, barely half the woman she once was. Only time will tell if she will heal- or if Destiny will give her the release she longs for.